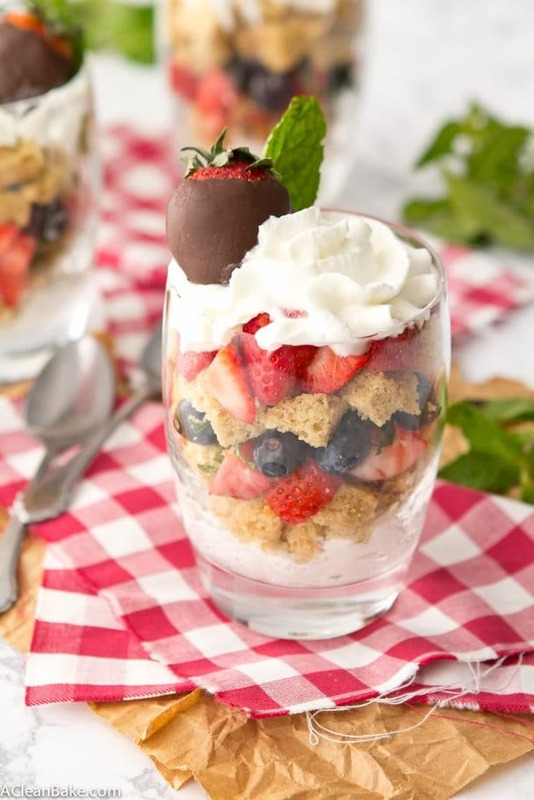 A cake trifle is the easiest dessert to throw together! It is just layers of alternating cake, whipped cream and berries. This version is gluten free, grain free, paleo, dairy free and so enjoyable! I agonized for a long time about this one; about whether or not to post it… because of the pictures. Ugh. Apparently “being real” is all the rage in blogging these days (It used to be all about glorifying this impossible ideal of a social-media-ready life, but now – more and more – I’m seeing bloggers glorifying the rejection of the glorified social-media-ready life… Yeah, my head’s exploding too.) so I’ll bite, for like a second, and admit that I almost held this one back because my perfectionism almost got the best of me. I made the chocolate covered strawberries the night before I assembled and photographed these, and in my hurry and exhaustion, forgot to cover them so they shriveled a little bit. And I’m such a lunatic that that was nearly a dealbreaker even though these are basically the perfect last-minute Valentine’s Day dessert and it would have been, frankly, idiotic and cruel of me not to share them because the strawberries (and, let’s face it, the white balance) weren’t visually perfect. What can I say? My brain is a little off-kilter these days. Sleep deprivation does funny things. But that’s all I’ll say about that because I promised myself I wouldn’t turn into one of those bloggers who complains about how grueling their lives are when they get to stay home baking and taking pictures of amazing food all day or one of those moms who just whines about how tired I am. You don’t care. And I don’t really want to dwell on it. Especially not during a week that is supposed to be all heart eye emojis and giddiness – however Hallmark-induced – when we should be talking about the things we love. Trifle is, as far as I can tell, some kind of Latin or Ancient Aramaic (or neither, more likely) word that translates into “a mess of ingredients that, when layered together in a glass receptacle, turns out really attractive and delectable”. Yes, I’m almost certain that is the exact translation. Because it’s supposed to be kind of a beautiful mess, you don’t have to have any of the special skills or decorating prowess that many Valentine’s Day baked goods call for. I’m looking at you, sugar cookies. They’re super adaptable to your, or your loved one’s, taste(s). Like, I wouldn’t blame you if you used chocolate cake instead of vanilla…. They take no time at all, so if you sorta kinda totally forgot Valentine’s Day was on the horizon, make these and no one will be the wiser. It’s like you planned it all along! 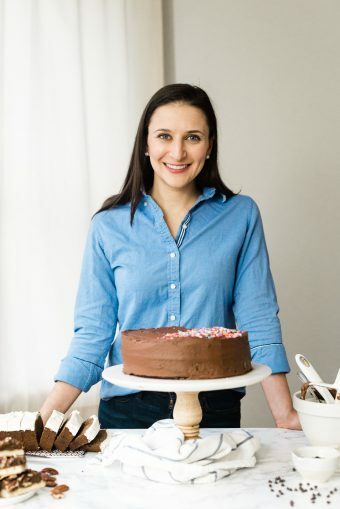 (Hint: If you are super last minute, you can use Simple Mills cake mix in place of homemade cake to save even more time). So, dessert is officially taken care of. The card, though? That’s all you! Line a small baking dish or sheet with parchment paper and set aside. In a medium heatproof bowl, melt the chocolate in the microwave in 30-second increments (stirring in between) or over a double boiler. 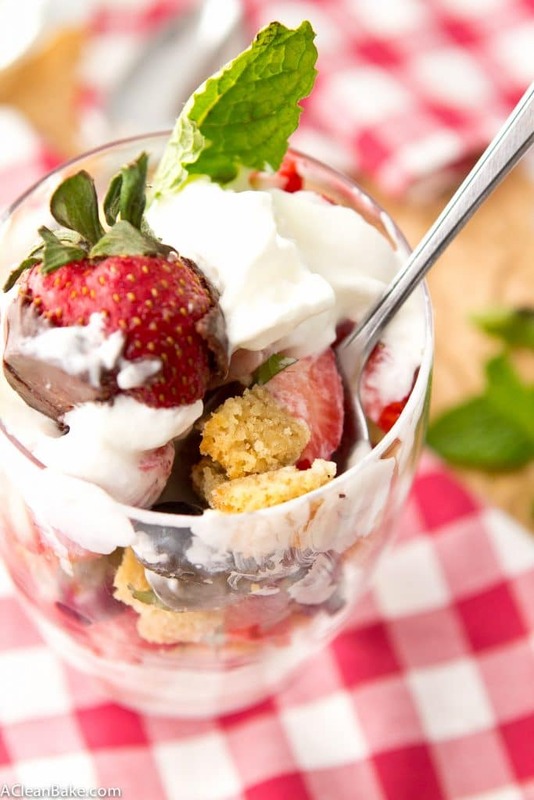 Gather the leaves of one of the strawberries into a handle and dip it into the chocolate. Shake gently to remove excess chocolate, then place on place on its side on the prepared dish or sheet to set. 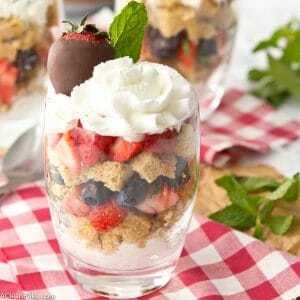 Once the berries have set, prepare the trifles: add 1/4 cup whipped cream to the bottom of two wide and squat glasses (such as an Old Fashioned glass). 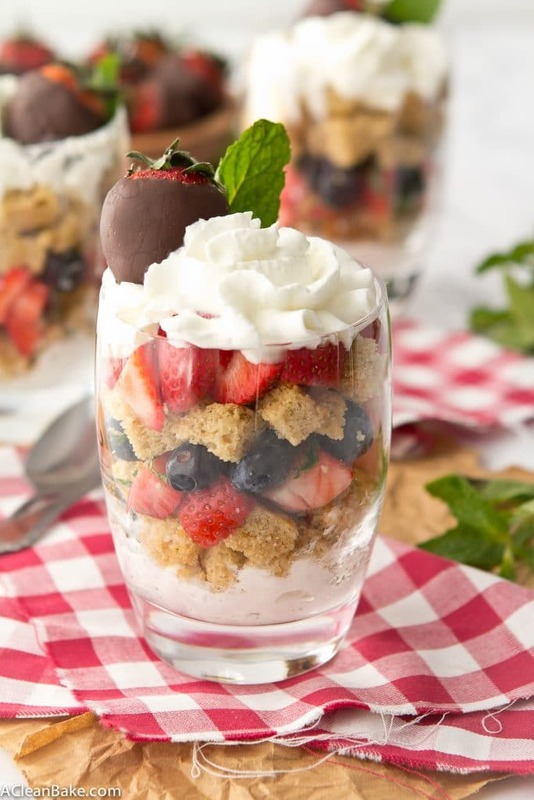 Add a layer of cake cubes to each glass (about 1/2 cup each), then a layer of berries (about 1/3 cup mixed blueberries and strawberries each), a sprinkle of mint leaves, another layer of cake, then a final layer of whipped cream. 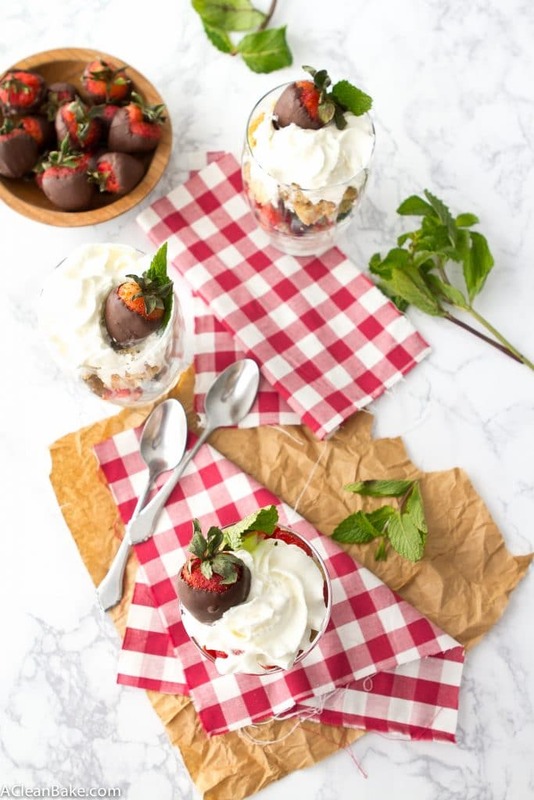 Finish each trifle with a chocolate covered strawberry (or two) and a fresh mint leaf.